(Nanowerk Spotlight) Researchers in Belarus developed a new technology that significantly improves the safety of using laser nano-thermolysis to destroy cancerous cells. The method, dubbed LANTCET (laser activated nano thermolysis as cell elimination technology), uses clusters of gold nanoparticles to create vapor microbubbles that can kill targeted cells. Dmitri Lapotko, first author of a recent paper ("Selective laser nano-thermolysis of human leukemia cells with microbubbles generated around clusters of gold nanoparticles") published in the May 30, 2006 edition of Lasers in Surgery and Medicine, explains LANTCET to Nanowerk: " All currently employed methods for purging malignant cells do not possess efficacy (ability to destroy as many target cells, ideally, all of them, as possible) and safety (capability to keep all normal cells viable) sufficient for clinical needs." Lapotko is director of the Laboratory for Laser Cytotechnologies at the Luikov Heat and Mass Transfer Institute in Minsk, Belarus. His collaborators are researchers with Fairway Medical Technologies in Houston, Texas, the Belarusian Research & Production Center for Hematology & Transfusiology, and the Belarusian Research Center for Pediatric Hematology and Oncology, and the State Center for Bone Marrow Transplantation in Minsk. "Here" says Lapotko, "we introduce a novel chemical-free purging method that selectively damages tumor cells through generation of laser-induced micro-bubbles around clusters of lightabsorbing nanoparticles targeted to tumor-specific receptors in the cells." The researchers use a two-stage targeting method to form clusters of gold nanoparticles selectively in target cells (human leukemia cells in bone marrow or blood) and then damage these cells through vapor bubbles that form around the nanogold clusters upon their irradiation with a laser pulse. The bubbles damage the cell where they emerge but do not damage surrounding cells. Because nanoclusters, with dimensions exceeding 200 nm, can create microbubbles at lower laser energy than can individual nanoparticles, the potential damage to healthy tissue is reduced. 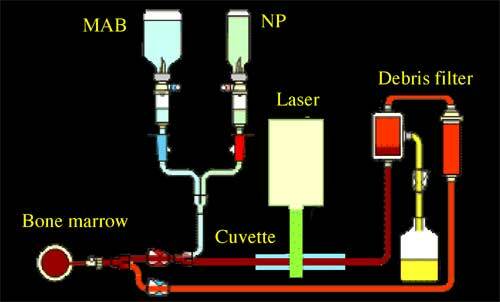 The researchers' results show that an immediate damage of >99% of human leukemia cells (acute lymphoblast leukemia) can be achieved with a single laser pulse at the fluence of 0.6 J/cm2 (532 nm, 10 ns). Survival of normal bone marrow cells was in the range of 49% to 87%. Recent experiments with acute myeloblast leukemia samples yielded 95-99% killing efficacy of tumor cells at 1.5 J/cm2 with survival of normal bone marrow cells at the level of more than 90%. "We have achieved the high selectivity of nanoparticle cluster formation in targeted tumor cells through a two-stage incubation procedure" says Lapotko. "In the first stage, nanoparticles have been selectively coupled to the membranes of target cells using MAB (monoclonal antibodies, the antibodies used by clinical laboratories to diagnose specific subsets of acute B-lymphoblast leukemia in human patients). To enhance coupling of multiple nanoparticles to one cell surface receptor we used the so-called sandwich method with a primary and a secondary MAB. 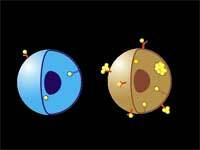 At the second stage we form clusters of nanoparticles inside those cells by employing endocytosis"
LANTCET improves efficacy because it provides immediate damage to specific cells only and does not depend upon biology and chemistry of drug-cell interactions like in the case of photo-dynamic therapy or chemotherapy. 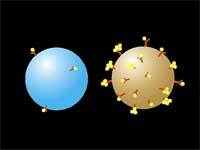 Imaging studies showed that the clusters of nanoparticles emerge only in tumor cells and that normal cells may take up the some nanoparticles though no clusters emerge in them. Safety is also improved because LANTCET is much less toxic than other methods that use chemical agents to kill the cells. According to Lapotko, a near-term application of LANTCET could be purging blood and bone marrow transplants during autologous bone marrow transplantation, thus improving transplantation results. Longer term, he and his colleagues will try to apply LANTCET against solid tumors in vivo.